Observations during FDA inspection can be avoided. By making strategy for the inspection the FDA 483 observations can be reduced. 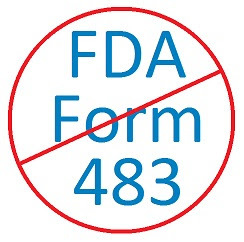 483 is a FDA form that is issued to report the GMP inspection observation by FDA officials. It contains all objectionable activities found by the FDA inspector during the inspection of a manufacturing facility. FDA inspectors have good experience of inspections and they know very well that where the GMP violation would occur therefore it is almost impossible to hoodwink the FDA inspectors. But it is possible to reduce the occurrence of 483 observations by following ways. 1. Complying with CAPA: The absence of a proper system for Corrective and Preventive Action (CAPA), is a major cause of issuance of a 483 by FDA. Manufacturers should be aware of this to implement a proper procedure for CAPA. Corrective and Preventive Actions should be taken for all deviation and these must be closed properly with root cause analysis. 2. Control on Production Activities: Manufacturers should have proper control on all activities and documentation in production and quality control. Everything should be written and procedures should be followed. 3. Data Integrity: Data integrity is also a big factor that is responsible for the issuance of 483 by FDA. Data integrity issues are commonly observed in quality control. Access rights and data files for different instruments must be controlled. 4. Investigations: Investigation of the OOS, OOT, documentation errors and complaints etc. should be done and documented in specified time frame. Proper investigation of the issues shows the sincerity of the firm’s management towards the product quality. FDA investigators look for the ‘quality culture’ in manufacturing facilities they are investigating. There are different issues those are found in different facilities investigated by the FDA inspectors. But above ways can help to avoid the occurrence of the FDA 483 and warning letters. It is a pleasure and eventful when reading your article, Ankur.